By the time you read these words of The Legal Genealogist, it will be sometime Monday, February 8th, in my home country of the United States. But it will already be Tuesday, February 9th, in Australia. Which is where The Legal Genealogist will be, by the time you read these words. I will have been transported — by means of a very large very modern airplane operated by a company called Qantas — from my home to the Land Down Under, where I will be for most of the next month. 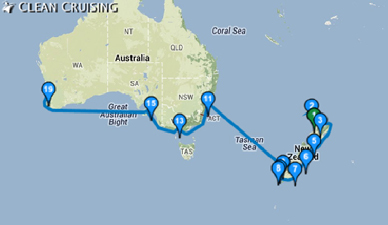 From there, it’s on to Brisbane again for a final set of presentations, and back to the United States on March 6th. But that, of course, is not what used to be meant by being transported to Australia. Was on the south island of New Zealand last April with my cousin, also named Patrick Deady, who I discovered through Y DNA testing. I think you will love the south island as it is beautiful and the people are so lovely! Have a great trip!! A visiting Australian genealogist did a program for our group on his family immigrants from the U.S. and Canada in the 20th century. The Canadian side went back to Loyalist immigrants from the U.S. Eventually all of the family was traced back to the early U.S. colonial period. They were found as immigrants from Britain to the American colonies but no one came directly from England to Australia. His research is one of the most complex genealogy projects I have encountered. So, some of the Australians got there by taking the long way around. If there is a clear night be sure to find a dark place and look up. Most of the interesting stellar objects are only visible down under. Many folks travel there for just that purpose.